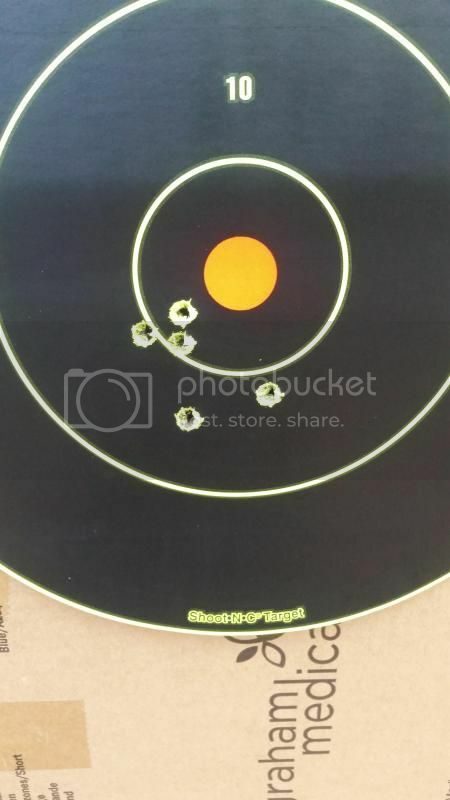 Ok....went to the range today and was quite disappointed with the results. I have been rolling my own for just over a year, today firing my 300 blk. 125 gr. Nosler BT, over 17 gr of Hodgens 110. I just couldn't get a tight group at 100 yards at all. Probably 2.5". 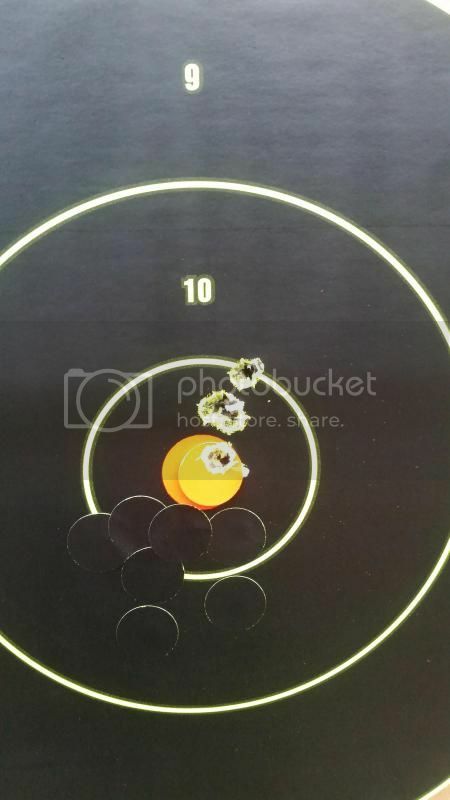 The thing that's killing me is I used to keyhole shots using the same load, same distance, same rifle. It probably has only a couple thousand rounds through it. Anyway, I'm wondering maybe if my powder scale (Hornady lock and load thrower/scale combo) might be degrading. It's only just over a year old. It says it's accurate to .1 grains. Could a few tenths of a grain make that big of a difference? I use the check weights every time I fire it up. I am very particular about my reloading. Single stage, measure every powder charge right at 17 gr. It's bugging me, any advice will be taken! Thanks! The temperature now is about 40 degrees cooler. But would that open a group up? Same brass, same primers. And here's the deal with my barrel. I went into it with a fairly dirty barrel. So I ran the boresnake down it quite a few times, did more firing, same result. The colder temperature WILL effect the pressure/velocity. You mentioned scales: For all my life I used a RCBS 10/10 balance beam scale, and I though it was accurate until I started using a digital scale and discovered the old 10/10 was off 1.25grs. Not likely at all. If a tenth of a grain is the diff between success and disaster, then you're working with a ridiculously sensitive load. And I would never measure every charge for any distance short of 600yds. Waste o' time. If your getting keyholes, then you need to pick a better bullet. That right there should tell you it's right at the edge of unstable. Plus or minus several tenths powder charge rarely shows up on target at 100 yards. Keyhole is a term that applies to bullets that are unstable and pass through the paper sideways. The way you used the word in your statement it sounded like you thought it was a good thing. Keyholing bullets always have horrible accuracy, sometimes missing the bullseye completely at 100 yards. Have you tried this bullet before in your rifle or were you using other brand and/or weights before? How much load development have you done with this bullet? Did you change primers with this batch of ammo? Cold weather can cause borderline loads to shoot worse. How stable was your shooting position? One range session and getting 2.5" groups can easily be attributed to a distracted shooter or simply changing primers on a given load. Were you cold when shooting? I would suggest more testing and a double check of you scales using a known test weight. I use mechanical scales. Electronic scales need to be warmed up one-half hour in advance of being used so they will stabilize. Fluorescent lights can cause electronic scales to drift. Ok, by keyholing, I meant that before, all 5 shots in my group were touching. (probably two months ago.) My position was fairly stable...not in a vice, but I had a good rest. All things remain the same, same bullets, same powder, same primers. All of my brass trimmed to within .003. But all likely to be different batches. No, I wasn't cold, my breathing was right. And definitely not distracted. I could understand if I was off center, but still holding a decent pattern, but at 100 yards to hold only a 2.5" group....well that's unacceptable. As I stated in the OP, I do use the checkweights every time I fire the scale up. How many times have those cases been fired? How long since you annealed them? In addition to the other questions raised by those above: Do you chronograph your loads to ensure they are getting consistent velocities, and if so, what did the velocities look like with the good loads compared with now? Also, "clover leafing" is for when group holes are touching each other. They are reformed cases from LC 5.56 brass. 1x fired as 5.56, and 1x fired as 300 AAC. I didn't anneal them. The thing that's confusing me is I haven't changed what I'm doing to load them, and all the components are the same. The only thing that has changed is the point of impact. I went from nice tight sub MOA groups to terrible groups. That's why I was wondering if a fre 10ths of a grain would matter, if my scale was off. I was just working up a few more loads from scratch, still using the same components, and noticed that my OAL is not consistent without having to screw with the seating adjustment every time. So, my next question is, would 5-7 thousandths of seating depth make that difference? I'm using Lee dies....maybe I'm grasping at straws here...? Nope, no chronograph. Key holing was simply a term used when I was in the Marines...guess I never picked up clover leafing. "Key holing" is the oblong shapd hole you get when a bullet is no longer stable and passes thru the target sideways. It ranges from an oval hole (bullet slightly off axis) to a full-on profile of the bullet (bullet passes thru sideways rather than point first). Tell us about the shape of the groups. It is extremely unlikely that any reasonable amount of powder weight variation could cause a 1 MOA group to open up to 2.5 MOA at 100 yards. That said, if it was powder charge, it would most likely look like vertical stringing. It is also unlikely the barrel went bad so quickly, unless the muzzle was damaged. 1. Muscle tremors due to cold weather. It is still around the mid 50's here, and I was actually over dressed. It definitely wasn't due to me being cold. I'm going out again tomorrow with some new loads I put together tonight. Ill snap some pics if I'm seeing the same results. Rifle is tight, scope base and rings are tight. Barrel is tight. We'll see what happens. But i will post the outcome. When you talk about all holes touching, the word I''m used to hearing is "Cloverleafs." Am I the first to ask if theres a difference in wind? It really takes still air to get all holes touching. If the wind is unsteady or gusting, that could get you to 2.5" groups even with good technique on your part. They are reformed cases from LC 5.56 brass. 1x fired as 5.56, and 1x fired as 300 AAC. I didn't anneal them. The thing that's confusing me is I haven't changed what I'm doing to load them, and all the components are the same. The only thing that has changed is the point of impact. I went from nice tight sub MOA groups to terrible groups. That's why I was wondering if a fre 10ths of a grain would matter, if my scale was off. I was just working up a few more loads from scratch, still using the same components, and noticed that my OAL is not consistent............................................................................. [without having to screw with the seating adjustment every time. So, my next question is, would 5-7 thousandths of seating depth make that difference? ]...........................................................I'm using Lee dies....maybe I'm grasping at straws here...? The section from your post that I separated and framed from the main body of your text is probably the problem. All bullets vary on the pointed end, some brands and lot #'s are better than others but there is always some variation in over all length when seating bullets. The reloader should never try to adjust this out by screwing the seating die up or down in an attempt to get identical overall lengths. This defeats your intended purpose and causes each bullet to jump a different length to the rifling. The seating die pushes on the bullets closer to the ogive and is therefore more accurate when seating bullets. Adjust your die so your ammo fits and feeds from the magazine and then leave it alone. Very high and variable cross wind. Do you have a free float rail? If not, be sure you are not changing the amount and location of pressure on your hand guard. I doubt minor variation in load would open a group up badly. Also, if they used to shoot well, and have degraded, muzzle wear/damage should be considered. Started with a factory load, just to establish for fact that it wasn't due to any sort of damage on my rifle. 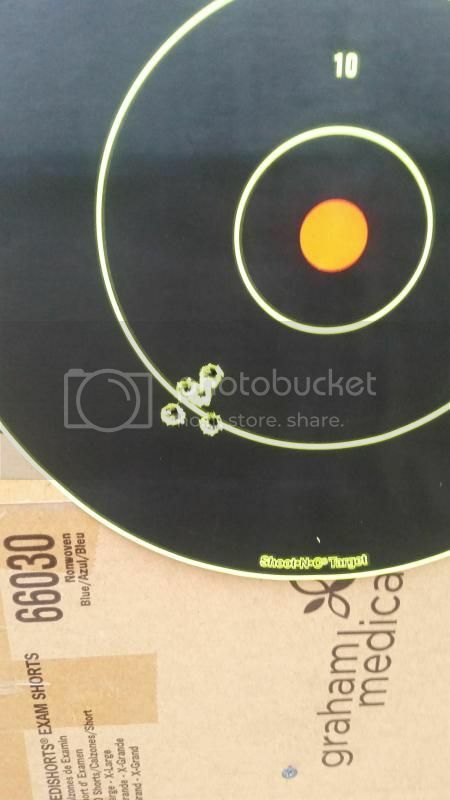 150 grain SP @ 100 yards, 5 shot group. Here is 18.0 gr. 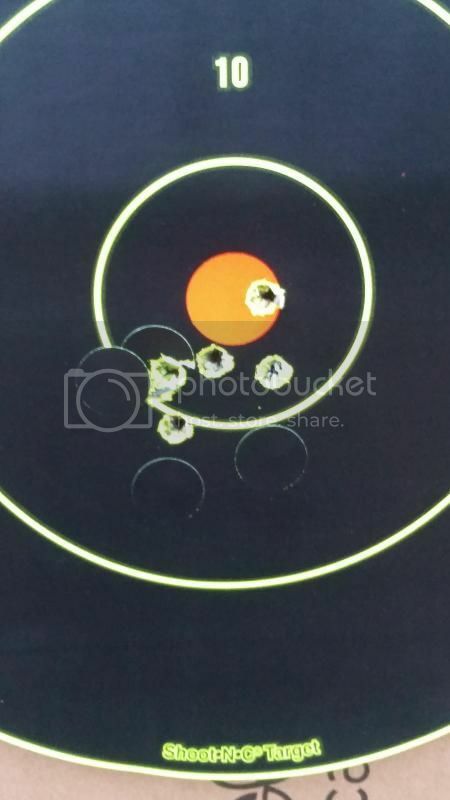 5 shot group. Things tightened up a bit with the hotter load. No pressure signs, not even flattened primers. Here is my position. Not the most stable, but it did enough for now. Caldwell DFT is on it's way to me. So, same powder, no issues with the weapon. The ONLY thing different what so ever, is that I cracked open a new keg of powder. Maybe a huge lot to lot difference? I'm confused. And as borderpatrol stated earlier, I apparently need to quit screwing with my seating die. I was under the impression that having the exact same OAL would make things more accurate. Last night I worked up three more loads to test. Starting with 18.0 gr, 18.3 gr, and 18.5 gr. Maybe I can get those groups a little tighter. It might be a few days before I can get out to test them, but I will post results here again if anyone is interested. Thoughts? Thanks to all that have responded! I had similar issues with my 300. Just so ya know I load 125 BT 18.0 h110 (2.060) oal. 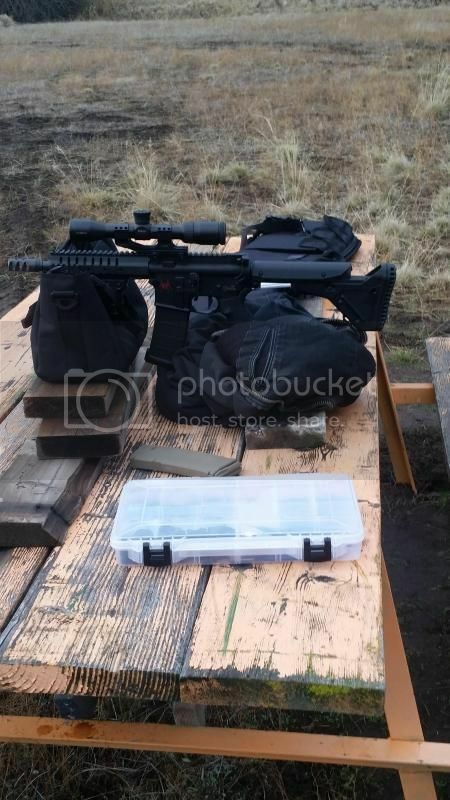 I was running black hole weaponry brake (one that has dragon and no side ports just forward ) I was shooting slightly under 1inch (5) shot groups at 100 yards for along time my barrel was cmmg 16" 1:7. Your barrel seems shorter from what I can tell correct me if I'm wrong. If your jumping from say 17.5 to 18 grains you might be missing a node in between . Try going in 17.2-17.4-17.6 and so on. Bm3...I did exactly that...but the results were just as crappy so I didn't bother posting the pics of them. The 18 gr was the tightest group. And that's why I worked up 3 more loads last night. I started at 18 gr, 18.3, and 18.5. We'll see how they perform. I'm just a bit too nervous to jump loads by an entire half grain. usmcscout. I'm running an 8.5 cmmg barrel...not sure that's making any difference. I've never shot cast bullets, and simply went out with all of the same components and used the same data. I'm perplexed now for sure because now that I increased the load its tightened the group back up. I'm scratching my head but at least I'm seeing improvements.